30 miles roundtrip from my home in Torbert Village to Bluestone Run (north of Jersey Mills) and back. What a gorgeous, sunny first day of summer outing! 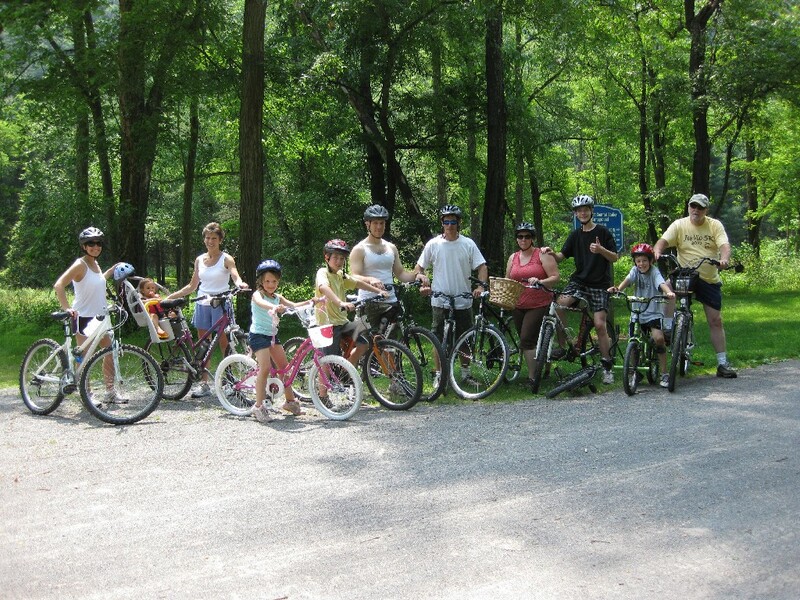 Hot—yes—but not very humid, so once I was moving, it was very comfortable biking. Passed 2900 miles for the year. Between Ramsey Village and Waterville, I passed two DCNR vehicles, the one in front mowing, the “trailer” spraying. Then I met Weldon Cohick, the trail sage, and we chatted for about 15 minutes, both of us lamenting the fact of the invasion of our beloved valley by the Marcellus gas companies. At McConnell’s Country Store I refreshed with a can of coke and small-talk with the store employees and other customers out at the porch picnic tables. Viewing the Anadarko gas rig clearly visible on top of Puderbaugh Mountain a mile south of Waterville, I wondered whether a postcard of that sight, perhaps ironically entitled “The Beauty of Pine Creek Valley 2010,” might become a best seller with tourists. 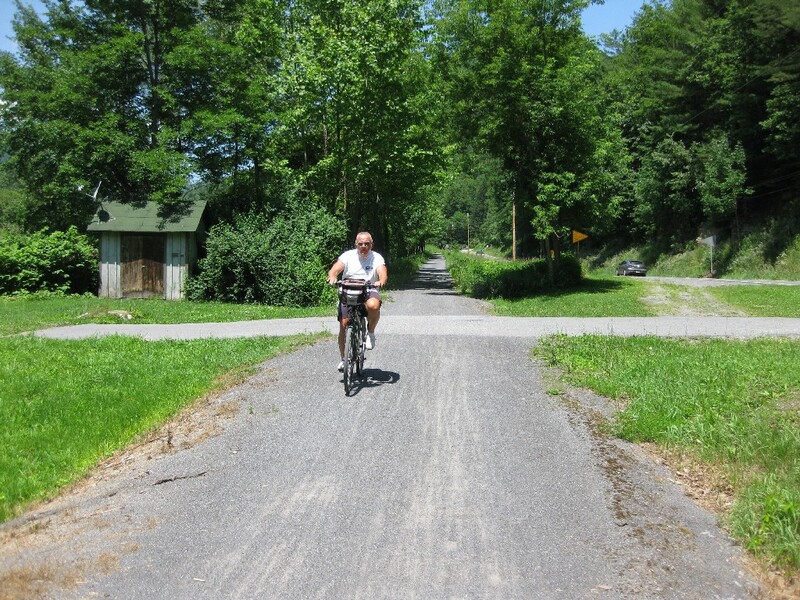 I met Tom Smith (who rode over 6500 miles in 2009 on the rail trail) at Bluestone Run north of Jersey Mills, and decided to turn around and ride with him back south. Just south of mile-marker 155, he had us stop to look for a rattler he had seen on a recent ride at a projecting rock-face right on the east side of the trail. No luck today. Back at McConnell’s in Waterville, we stopped for ice cream. Tom had his usual vanilla with hot fudge “barebones” sundae, while I had a “twist” in a cup, topped, at no extra expense, with the nuts, whipped cream and cherry that Tom eschews (thanks Tom!). 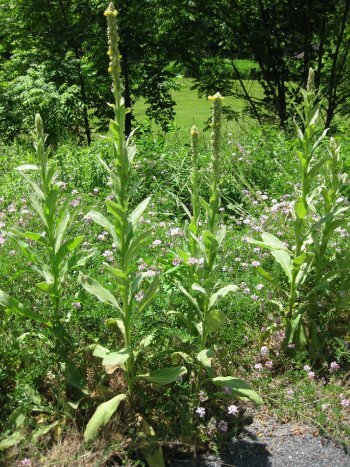 Stopped and chatted with Chuck Diggan, DCNR employee, who identified a trailside plant for me—the Great or Common Mullein. Tom and I parted ways at the Torbert Village gate, he to continue for the remaining 8-9 miles to his home in Antes Fort, I to my village home and a much needed shower.